Cherry red light all over my face, been walking so far that I lost my place. 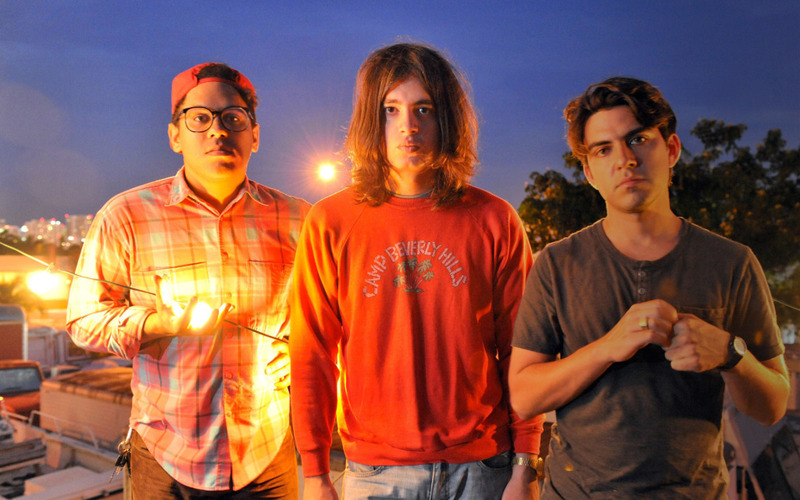 Jacuzzi Boys are a garage rock band from Miami, Florida. The group formed in 2007 and features Gabriel Alcala on guitar and vocals, Diego Monasterios on drums and Danny Gonzales on bass. With most songs being shorter than three minutes in length, Jacuzzi Boys pack a punch with sneering vocals aided by a bright guitar, riotous drums and thumping bass. Garnering a reputation for their sonic flavor and raucous local concerts, the group was quickly signed by Florida's Dying Records, who would release a series of 7 inch records along with their debut LP entitled No Seasons in 2009. In 2010, the group received benediction from punk legend Iggy Pop, and later went into the studio to record a split 7'' single with the masked garage force of nature known as Nobunny. Catching onto the hype, Jack White contracted the group to record a live vinyl LP in 2011 for his record label, Third Man. In 2011, Hardly Art records released the group's most recent LP entitled Glazin'. Mojitos on the beach by day, followed by a night of dancing at balmy clubs playing thumping house music—those are just some of the images that spring to mind when thinking about Miami. But those stereotypes are shattered upon hearing the first few notes of Jacuzzi Boys' debut LP, No Seasons. The Miami-based garage rockers kick things off with “Blow Out Your Lights,” a scuzzy song that packs in heavy reverb, echoey vocals, and crashing drums—all in the span of just around a minute and a half. Lead singer and guitarist Gabriel Alcala repeats the phrase “House made of stone!”, stretching it out until it sounds like he's falling off a cliff into the vast unknown. Formed in 2007, the trio—including drummer Diego Monasterios and bassist Danny Gonzales, alongside Alcala--draws influences from early Rolling Stones, to The Flying Burrito Brothers, and Lou Reed. The enigmatically-titled “Komi Caricoles” starts out with a completely 60s psychedelic style (“I'm running through the sky,” sings Alcala), but suddenly breaks into the 21st century with a frantic tempo change towards the end. Clocking in at three minutes and forty seconds, it's the longest track on the album. Despite the title No Seasons, many of the songs on the album have a distinctively summery feel. “Burn It Down” is awash with surfy guitar riffs, and a slightly Brit-rock flavor, with Alcala declaring, “I'm taking all your magic, girl, I'm taking it home!” They might be relative newcomers on the garage scene, but their old-school rock sensibilities have garnered the attention of more established acts in the music industry: Iggy Pop is a fan, and Jack White released a live recording of theirs on vinyl for his label, Third Man Records. Grimy, lo-fi, and psychedelic, Jacuzzi Boys prove that Miami is more than just a haven for bronzed beach bums and club rats. Mojitos on the beach by day, followed by a night of dancing at balmy clubs playing thumping house music—those are just some of the images that spring to mind when thinking about Miami. But those stereotypes are shattered upon hearing the first few notes of Jacuzzi Boys' second LP, Glazin'. Like their 2009 debut LP No Seasons, it's full of reverb-heavy guitars, echoey vocals, and crashing drums. Formed in 2007, the trio—guitarist/singer Gabriel Alcala, drummer Diego Monasterios and bassist Danny Gonzales—draws influences from early Rolling Stones, to The Flying Burrito Brothers, and Lou Reed. They're relatively new on the garage scene, but their old-school rock sensibilities have garnered the attention of more established acts in the music industry: Iggy Pop is a fan, and Jack White released a live recording of theirs on vinyl for his label, Third Man Records. While the band was en route between New Orleans and Texas, we spoke with Danny Gonzales (with occasional input from the other band members) to find out the ideal first Jacuzzi Boys listening experience, the Miami music scene, and what they'd do during a UFO attack. Band of the Day: Question: If you could control a someone’s first Jacuzzi Boys listening experience, what would that ideal set-up be like? Band of the Day: From experience, it's a good 'putting on makeup' soundtrack! OK, so as a new young band on the road, what are some of your money-saving tips? Danny: We try not to eat gross food, so we kinda splurge on food. But besides food, we try not to spend too much on things, except the occasional hotel room. Oh, but sometimes we'll get the five dollar footlong Subway sandwich and split it! Band of the Day: What's the first band that you guys all bonded over? Danny: I think Gabriel and Diego bonded over New York Dolls. They started as a two piece, and then I joined later that summer. I guess one of the first times we had band practice, we all listened to the Ramones. Band of the Day: Did you guys have a moment where it clicked with you guys that you knew it was right combination of people for the Jacuzzi Boys? Danny: I don’t know because there really hasn’t been anyone else since we first started as a band. We haven’t felt like adding anyone else because it kind of just worked pretty natural for us from the beginning. Band of the Day: Are your family and friends pretty supportive of the band? Danny: Yeah! All of our friends usually come to our shows, and my family has come to a few shows before. One time we played the Shrine [in Miami], and my parents actually met at the Shrine. My family came and they were like, “You guys were really good, but you need to talk to the audience more!” (laughs). Our families get excited, and they're really supportive and don't give us too much sh*t about it (laughs). Band of the Day: Did you guys ever have like a “Holy sh*t!” moment when you realized you could make a living by being in a band? Danny: Well it's kind of a stretch to say “doing it for a living” just yet, but somehow we still we manage to get by! Band of the Day: Is this a full time thing now or do you guys have other day jobs? Danny: I used to work with my family in restaurants, and Diego worked with his Dad doing flooring, but that hasn’t been happening lately, it's been more random. But we kind of just get by and we haven’t worked [day jobs] in a long time and we like it that way. Band of the Day: What’s the last YouTube video that made you laugh? Danny: I think it’s called like “The Talking Dog” or something? Band of the Day: Is it the one where the dog eats the treats and the guy is like yelling at it or something? Band of the Day: I’ve only ever been to the Miami Airport, so my image of Miami basically comes from the “Golden Girls.” So how supportive is the music community down there? Danny: Now I would say it’s pretty damn supportive! We’ve managed to build up quite a fan base at home. At first it was like our shows were kind of “oh, they’re okay.” It's not like a ton of people were coming out at first. But, there’s one show that we played right before our tour, and I was like, “Oh my God, I’ve never seen it this packed before!” But it definitely didn’t happen overnight. Danny: It's funny that you asked that because we were just thinking about that! Like if there were dark clouds and these crazy huge UFOs come out and you would be like, “What do we do? !” I think we would just keep on driving. Diego says, “Wouldn’t you just turn around?” But there would be no point in turning around! Band of the Day: Yeah, because they would just come get you and beam you up anyway! So then, what would be the last Jacuzzi Boys song you would play and where would you play it?